Designation: Lecturer of clinical oncology, kasr elainy center of clinical oncology and nuclear medicine. Citation: Zawam H, Salama R, Alsirafy SA, Bishr MK (2018) Treatment Outcome of Acute Myeloid Leukemia in Egypt: A Developing Country Perspective. Int J Cancer Tremnt Vol: 1, Issu: 1 (53-59).. Copyright: © 2018 Zawam H. This is an open-access article distributed under the terms of the Creative Commons Attribution License, which permits unrestricted use, distribution, and reproduction in any medium, provided the original author and source are credited. Background: Acute myeloid leukemia (AML) is the commonest type of leukemia in adults and the 6th highest cause of cancer-related death in males worldwide. There is a paucity of studies reporting treatment outcome of AML in developing countries, which prompted shedding light on challenges affecting survival of AML patients in Egypt. Methods: This retrospective study investigated treatment outcomes of 90 AML patients treated during the period January 2010-December 2014 at Kasr Al Ainy Center of Clinical Oncology and Nuclear Medicine (NEMROCK)- Cairo University Hospital, Egypt. Results: A complete remission rate of 65% was achieved (n=52), while refractory disease was documented in 19 patients (13.8%) and early mortality rate was 12.5%. Half of patients in remission eventually relapsed and the estimated overall survival (OS) was 11.5 months (95% CI: 6-17). Hyper leukocytosis at presentation imposed poor response to chemotherapy (p-value: 0.047) and short OS (p-value: 0.003), while poor performance status was the prominent clinical factor affecting OS (p-value: 0.02). Interruption of induction therapy significantly impaired response rate (p-value: 0.003) and incomplete consolidation treatment due to infection had an adverse impact on both disease free- and overall survival (p -value <0.001). Complete remission after salvage therapy was associated with improved OS (p-value 0.025). BMI (Body mass index) and hemoglobin level did not affect the treatment outcome. Conclusion: There is an urgent need for availability of resources as optimal supportive care, routine testing of cytogenetic and molecular markers, and allogeneic stem cell transplantation. These advancements will allow for better risk-adapted therapy, timely delivery of treatment and reduction in morbidity and mortality of Egyptian patients. Identification of different risk factors that may affect the outcome is very important. Keywords: acute myeloid leukemia (AML); leukocytosis; survival; body mass index (BMI); treatment; relapse; Egypt. Acute myeloid leukemia (AML) is the commonest type of leukemia in adults, accounting for 25% of all leukemia types, and it ranks as the 6th highest cancer-related death in male population. Survival over the past two decades has increased due to incorporation of intensive treatment options, including bone marrow transplantation . Several clinical situations still represent a daunting challenge in the management of AML patients, including hyper-leukocytosis which dramatically increases early mortality rate . There are approximate 18,800 new cases diagnosed with AML each year in the United States alone, but estimated death is as high as 10000, ranking AML as the 6th highest cancerrelated death in male population . In Egypt, leukemia comprises 10% of all malignancies, with AML representing 16.9% . Approximately 60-70% of adult AML patients are expected to attain complete remission status after the first phase of treatment (induction), and more than 25% survive ≥ 3 years and may be cured. Survival for AML decreases markedly with age at diagnosis, and the prognosis in children is substantially better than that in adults . The modest improvement in survival over the past several decades can be attributed to supportive care, including better blood product support and better control of infections, as well as higher success in treating patients with better risk disease. This progress has been limited particularly in older patients who constitute the majority of the cases . This study analyzes treatment results and elucidates challenges during treatment of AML patients at one of the most comprehensive cancer centers in Egypt. The current study retrospectively analyzed the treatment results of adult patients with AML treated in the period January 2010-December 2014 at Kasr Al Ainy Center of Clinical Oncology and Nuclear Medicine (NEMROCK)- Cairo University Hospital, Egypt; as one of the specialized referral center in Egypt. Patients’ medical records were reviewed for baseline characteristics at presentation. Performance status was assessed according to Eastern Cooperative Oncology Group (ECOG) score. Height and weight were used to calculate body mass index (BMI), Patients presenting during pregnancy were identified according to their gestation weeks. The frequency of various clinical manifestations at presentation was calculated, and extra medullary disease was defined as a suspected extra medullary localization based on imaging and/or clinical examination without histological confirmation. Baseline laboratory tests were reviewed, and clinically relevant cut-off points were used for categorization. Hyper-leukocytosis was defined as total leucocyte count (TLC)>100X103/mL. The French-American-British (FAB) subtypes were identified and cytogenetic and molecular markers were documented whenever available; only t (8;21), inv16, FLT3-ITD and NPM1 mutations were tested at our center. But unfortunately at time of analysis, we had not complete karyotype analysis for all patients. We analyzed the types of regimens received, periods of delay, and rates of response, relapse and mortality. The time elapsed between presentation and start of treatment was calculated and classified to ≤ 7, >7-30, and >30 days. The standard induction regimen was “7+3 protocol”, consisting of 7 days of continuous infusion cytarabine 100 mg/m2 in addition to mitoxantrone 10mg/m2/day for 3 days. Upon blood count recovery and clearance of blast cells, bone marrow assessment was done to assess remission status. Patients who were refractory to treatment were scheduled for a re-induction course. It typically involved “7+3 protocol”, or “5+2 protocol” consisting of 5 days of continuous infusion cytarabine 100 mg/m2 in combination with mitoxantrone 10mg/m2/day for 2 days. Patients in remission were evaluated for the number of consolidation cycles received, as well as the presence of delay of more than one month between two or more cycles. Consolidation therapy consisted of high dose cytarabine 300mg/m2 over 3 hours every 12 hours on days 1, 3 and 5. Relapse rates were investigated and various regimens were used for salvage therapy according to patient’s tolerability, including “7+3”, “5+2”, high dose cytarabine. We also evaluated survival outcomes, as regards disease-free survival (DFS) and overall survival (OS), in correlation with different characteristics. DFS was calculated from the date of bone marrow examination documenting remission till date of relapse. OS was calculated from the date of presentation at our center till last date of follow up. Early mortality rate was defined as death within 30 days of initiation of induction chemotherapy. Statistical analysis was performed using the Statistical Package for Social Sciences (SPSS) version 14 (SPSS Inc., Chicago, IL) for Windows. Data was presented as numbers and percentages or mean ± standard deviation. The Kaplan- Meier method was used for survival analysis. This retrospective study investigated the treatment outcomes of 90 AML patients treated during the period January 2010-December 2014 at Kasr Al Ainy Center of Clinical Oncology and Nuclear Medicine (NEMROCK)-Cairo University Hospital, Egypt. Our center is one of the biggest referral center in Egypt, we treat patients from different countries as well. Baseline patients’ characteristics: Ninety adult non M3- AML patients were analyzed for their clinical characteristics at presentation (Table 1). A slight female predominance was observed (male: female ratio 1:1.3) and seven patients were diagnosed during pregnancy, or shortly after. Table 1: Baseline characteristics of 90 AML patients. At presentation, only 6 patients (7%) had extra medullary involvement including central nervous system (CNS), gastrointestinal tract (GIT), skin or lungs. On reviewing baseline complete blood picture, 17% of patients presented with hyper-leukocytosis. Excluding M3 cases, the most common FAB subtypes were M2, M5, and M4, respectively. Cytogenetic testing was done in 27% of cases and molecular markers were tested in 13% of cases (Table 2). Table 2: Immunophenotypic, cytogenetic and molecular profile of 90 AML patients. All patients presented to us received active treatment within few days after they underwent full investigation to identify the risk. None of the cases received treatment prior to presentation. Ten cases out of ninety (11%) didn’t receive active treatment. Early death was encountered in 5 cases due to either leukocytosis, uncontrolled infection or intracranial hemorrhage. The remaining 5 cases were ineligible for intensive treatment due to poor general condition. A total of 80 patients received first induction cycle, but only 75 patients were evaluable for response as shown in Table 3. Response was unknown in 5 patients (including foreigners who travelled directly after treatment). Time from diagnosis to treatment elapsed more than 30 days in 6 patients (7%) due to uncontrolled infections. Cytarabine monotherapy was used for induction in 5 patients due to presence of contraindications to anthracyclines: either ischemic heart disease with low left ventricular ejection fraction or previous administration of full doses of anthracyclines for a previous diagnosis of breast cancer. Twenty-three patients necessitated treatment interruption due to neutropenic fever, or markedly elevated liver functions. Table 3: Factors affecting overall survival in 90 AML patients. Upon statistical analysis, only the type of induction regimen and its interruption had clear impact on response rate. None of the patients who received cytarabine monotherapy achieved CR, as opposed to a CR rate of 64.8% among patients who received 7+3 protocol (p-value 0.02). However, cytarabine was received by only 5 patients, a small number to account for significance. Moreover, patients whose treatment was interrupted were less likely to achieve CR compared to those who completed their treatment course (CR rate 36.4% vs. 71.7%, respectively) (p -value 0.003). Out of 19 patients with refractory disease, 18 patients received a second course of induction therapy (re-induction), while 1 patient was unfit for further intensive therapy. Both “7+3” and “5+2” protocols were equally used in 6 cases, cytarabine monotherapy was used in 3 cases. CR was achieved by 6 cases, 10 patients had persistent refractory disease and mortality was encountered in 2 cases. Analysis of variable factors affecting response rate was done, and no difference in CR rate was found between various regimens used in second induction cycle. Overall, 52 patients (65%) achieved CR, refractory disease was encountered in 19 patients (13.8%), and mortality rate was 21.2% (n=17). The vast majority of patients in remission received consolidation therapy. A delay of more than one month between two or more cycles was observed in 50 % of cases, mostly due to prolonged neutropenia, severe infections or loss of follow up. By December 2015, 44.2% of patients were still alive in remission and relapse had occurred in half of the cases. Three patients (5.8%) died of febrile neutropenia during consolidation treatment. Out of 26 relapsed patients, 4 patients (15.4%) presented with concomitant extra medullary disease, including skin, breast and lung infiltrates. Only 19 patients (73%) were fit enough for salvage therapy. CR was achieved by 6 patients, 9 patients were refractory to treatment and 4 patients died of febrile neutropenia. Statistical analysis revealed that TLC at presentation had an adverse impact on response to salvage therapy. None of the patients presenting with TLC>100 X 103/mL or ranging from 20-100 X 103/mL achieved CR, this gives us attention that these patients need different treatment protocol, whereas patients presenting with TLC<20 X 103/mL had a CR rate of 60% (p-value 0.047). All poor risk and refractory cases were referred for allogeneic transplantation after CR to another hopsital (Nasser Institute). However, only 3 cases had matched donors and were eligible for transplant. The estimated overall survival of 90 AML patients was 11.5 months (95% CI: 6-17) (Figure 1). A total of 48 patients (53.3%) died by December 2015 and the causes of death are illustrated. Factors significantly affecting survival included: performance status, hyper-leukocytosis, number of consolidation cycles, and response to salvage therapy (Table 3). Overall survival of 90 AML patients. Figure 1: Overall survival of 90 AML patients. Patients who presented with performance status 1 had a median OS of 15 months (95% CI: 2.3-27.7), which was significantly higher than those with ECOG scores 2 or 3 (median OS 4.7 and 2.7 months, respectively) (p-value 0.02) (Figure 2). The median follow-up period was 24 months. Among different laboratory indices at presentation, baseline TLC had the strongest impact on survival. Patients with hyperleukocytosis had a shorter OS of only 3 months, compared to those with TLC levels <20X103/mL or 20-100X103/mL (median OS 15 and 12.8 months, respectively) (p-value 0.003). The number of post-remission consolidation cycles impacted both disease-free and overall survival outcomes. Overall survival of 19 AML patients who received salvage therapy according to response rate. Figure 2: Overall survival of 19 AML patients who received salvage therapy according to response rate. According to the guidelines the number of the planned consolidation cycles was 3-4 cycles and then referral to allogenic transplantation for poor risk or refractory cases. The highest DFS was noted in patients who received 4 cycles achieving a median DFS of 19.4 months, while the lowest was noted in patients who received only 1 cycle due to persistent infection or refusing further therapy (median DFS 4.8 months) (p-value <0.001). Moreover, patients who completed 4 cycles had a median OS of 32.7 months, whereas median OS was not reached in patients who received 3 cycles. In contrast, patients who received only 1 or 2 cycles had median OS of 3.1 and 5.3 months, respectively (p-value <0.001). Response to salvage therapy was shown to impact survival as well. Among 19 patients who received salvage treatment, OS was not reached in those who attained CR; whereas median OS was 12.2 months for refractory cases (p-value 0.025) (Figure 2). This retrospective study included ninety non M3-AML patients. The ages of our patients ranged from 18 to 76 years, with a mean of 37.8 years. A slight female predominance was noted (male to female ratio was 1:1.3). The commonest FAB subgroup was M2 followed by M5. Another study at National Cancer Institute (NCI)-Egypt on 82 adult AML patients showed comparable epidemiological characteristics of Egyptian patients. Their ages ranged between 18 and 68 years with a median of 34 years. Male to female ratio was 1.05:1, and the commonest FAB subgroups reported were M1 and M2 . The mean age at diagnosis of AML patients in Egypt seems to be considerably younger than that stated in the western literature. In a SEER review of 13,238 AML patients, the age range was 15-90 years and mean age at diagnosis was 61.6 years . Poor performance status at presentation is a strong predictor of mortality in AML. In a cohort study including 2,805 patients, the adjusted mortality rate was shown to be 1.08 for patients with ECOG PS 1, and increased to 1.35 for PS ≥ 2 . Consistently, our study concluded that poor performance status was associated with lower OS, but not DFS. On evaluating the effect of BMI on survival in our patients, no difference was seen between various BMI groups. Half of our patients were either overweight or obese, and they had similar survival outcomes to normal BMI patients. This finding was in concordance with what was concluded by Mulkey . Out of 51 females in our study, 7 patients were diagnosed during pregnancy or shortly after. One patient was 6 weekpregnant when she had missed abortion, and started induction treatment 2 days later. Another patient presented during her second trimester (20 weeks), received induction therapy and lost follow up afterwards with unknown outcome. Three patients presented during third trimester; 2 of them started treatment after delivery and 1 patient received 7+3 protocol then delivered a healthy baby 1 month later. Two patients presented immediately after delivery. On analyzing their outcome, they had similar response rates and survival to non-pregnant females. The median OS of pregnant cases was 15 months, compared to 12.8 months in non-pregnant cases. However, in a systematic review of literature on 174 pregnancy-associated AML cases, the median OS was 10.5 months which was markedly less than the median OS of 3 years reported in age-matched nonpregnant cases. The poor prognostic impact of pregnancy in our study might have been abolished by several factors that correlated with improved survival. Pregnant females had better performance status at presentation (ECOG 1: 100% vs 45%) and lower hyper-leukocytosis incidence (14% vs 18%) than non-pregnant females. All pregnant cases received “7+3 protocol” induction, whereas 6.8% of non-pregnant cases received cytarabine monotherapy and another 6.8% were not treated at all. Concomitant extra medullary disease was diagnosed at presentation in 6 patients (7%), including CNS, GIT, skin, and lungs; with an equal gender distribution. Half of them had ECOG performance status ≥ 2. A higher incidence of 23.8% was reported in an analysis of 3,522 AML patients treated on consecutive ECOG trials. The most affected sites were lymph nodes, GIT and skin; and those patients tended to be males with poor performance status. Manola reported that the presence of extra medullary disease was not independently prognostic of survival in AML patients . Similarly, our study showed that extra medullary disease had no significant impact on relapse rates or survival. Among various laboratory indices, only hyperleukocytosis significantly hampered OS and response to salvage therapy. Response to induction therapy was also lower (CR rate 35.7%), compared to those presenting with counts <20 X103 or ranging from 20-100 X103/mL (CR rate 72.7% and 64%, respectively). But no statistical significance was noted (p-value 0.056). The poor response rates in those patients may indicate underlying drug resistance. It has been shown that high expression levels of multiple drug resistance genes had a significant correlation with high TLC, accounting for treatment failure in this subgroup of patients . Moreover, high TLC is strongly associated with p53 deletion, which in turn hampers response to chemotherapy . Only 24 cases in our study were evaluated for cytogenetics, and 12 patients for FLT3-ITD and NPM1 mutations. FLT3- ITD mutation was associated with a lower CR rate (50% vs 75%; p=0.54), and lower OS (5 vs 8 months, p=0.067) than wild type. Although our results were not significant, they showed a trend towards poor prognosis with FLT3- ITD mutation, which is a well-recognized poor prognostic factor in AML . Our study included patients since 2010, an era in which those markers were not regularly available for routine use at our laboratories. Unfortunately, limited resources still impose a significant challenge towards proper risk stratification of patients, which hinders risk-adapted therapy. In our study, 80 patients received active treatment and the time elapsed between presentation and start of treatment ranged from 1 to 84 days, with a mean of 12 days. The major cause of treatment delay in most patients was uncontrolled infection. OS of patients who started treatment within a week was 17.2 months, as compared to 11.5 months for a delay of >7-30 days, and only 4.1 months in patients who were delayed for more than 30 days. However, this difference was not statistically significant (p-value=0.38). Several studies showed contradictory results regarding the impact of time from diagnosis to treatment (TDT) on survival. A retrospective study on 1,317 AML patients had a median TDT of 4 days, and a range of 1-78 days. Longer TDT was associated with worse CR rates and OS only in patients younger than 60 years, and this effect was more pronounced with a TDT of 5 or more days . In contrast, the impact of TDT on AML prognosis was denied in another retrospective study on 599 patients, where the prognostic impact of TDT was offset by other more powerful prognostic factors . During induction therapy, 29% of patients (n=23) required treatment interruption and this was associated with a lower response rate. CR was achieved in 57.5% of our patients, while 23.8% had refractory disease. Early treatment-mortality was encountered in 12.5% of our patients. Our study reported higher CR rate and refractory disease, and lower early mortality than that reported in another Egyptian study held at NCI, Cairo. Out of 82 AML patients treated at NCI, 51% of patients achieved remission, 10% were refractory and 39% of patients died very early before evaluation of treatment effect. At our center, we adopted the strategy of treatment interruption with the onset of neutropenic fever, which reduced treatment-related mortality at the expense of response rate. And this might explain the lower mortality rate and higher percentage of refractory disease compared to those reported from the NCI study, where no data was available about treatment interruption. It is noteworthy that the NCI study included acute promyelocytic leukemia patients, a subgroup known to have a more favorable outcome than the rest of FAB subgroups. Also, El-Zawahry studied patients who were treated more than a decade ago (1999-2002) which also explains the discrepancy of results between both studies. Hahn compared early mortality rate (EMR) between a SWOG report of 968 patients and that of the general population by conducting a SEER analysis on 26,272 patients. The EMR was 26.7% in the SEER cohort versus 12.2% in the SWOG cohort, emphasizing the importance of treating AML in highly specialized centers. In our study, EMR was similar to that reported by the SWOG analysis (12.5% vs 12.2%, respectively) . A total of 52 patients (65%) achieved remission after 2 induction cycles. More than twothirds of them received 3-4 consolidation cycles, and half of patients had a delay of more than one month between two or more cycles. The number of consolidation cycles, but not inter-cyclic delay, had a significant impact on both overall and disease-free survival. Also, relapse rate was the highest (57.1%) in patients who received only 2 cycles, with no statistical significance (p-value =0.93). Upon relapse, different salvage regimens were administered in our study and no difference was seen in response rate among them. A second complete remission (CR2) was achieved in 31.6% of patients, which strongly impacted OS (p=0.025). A retrospective study on 1,535 patients in remission revealed a relapse rate of 66% at a median interval of 8.8 months after achieving CR1. 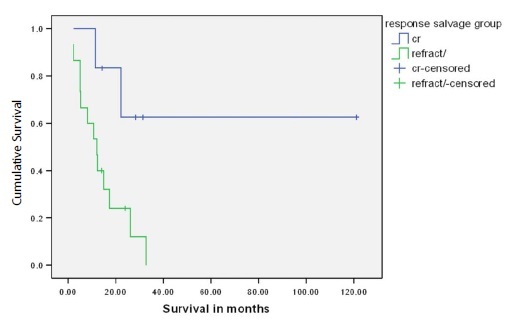 A CR2 rate of 50% was achieved and a multivariate analysis showed that both CR2 achievement and salvage allogeneic transplantation after relapse were significantly associated with improved OS . 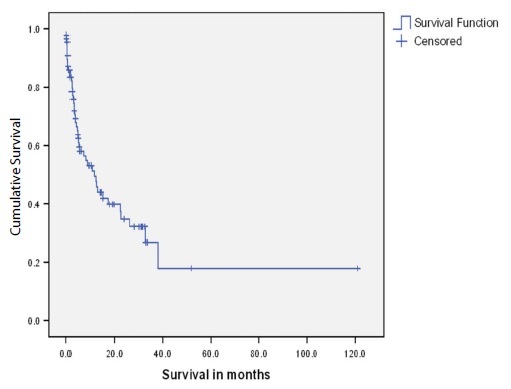 The overall survival of 90 AML patients in our study was 11.5 months (95% CI: 6-17). The prognostic factors of survival concluded were baseline TLC, ECOG performance status at presentation, type of first induction regimen, number of consolidation cycles and response to salvage therapy. Forty-eight patients (53.3%) died by December 2015. Allogeneic stem cell transplantation (SCT) is an integral part of treatment of AML patients. A meta-analysis of 24 trials covering data from 6,007 patients illustrated that allogeneic SCT has a significant OS and relapse-free survival benefit in patients in first CR with intermediate- and highrisk karyotypes but not for patients with good-risk AML . Moreover, a subset of relapsed patients can still be cured by allogeneic transplantation and achieve long term survival [19,20]. Unfortunately, the tremendous resources required for this procedure are not widely available in Egypt, which besides long waiting lists, contribute to treatment failure and mortality in Egyptian AML patients. Several limitations are present in our study owing to its retrospective design. Nevertheless, this study elucidates the magnitude of the problem in treating AML in developing countries as Egypt. There is an urgent need for availability of resources as optimal supportive care, routine testing of cytogenetic and molecular markers, and allogeneic stem cell transplantation. These will allow for better risk-adapted therapy, timely delivery of treatment and reduction in morbidity and mortality of our patients. All procedures performed in this study were in accordance with the ethical standards of the institutional and/or national research committee and with the 1964 Helsinki declaration and its later amendments or comparable ethical standards. A written informed consents were taken from all patients.